Land recycling is still low in all European countries: on average, land recycling accounted for only 13.5 % of total land consumption in European cities in the 2006-2012 period. The land use densification process, i.e. when land development makes maximum use of existing infrastructure, accounts for the largest proportion of land recycling (10 % of total land consumption). However, in most countries, land take dominates over densification in total land management with the exception of Finland and France. Grey recycling, i.e. internal conversions between residential and/or non-residential land cover types, is secondary to densification, ranging from 14 % to less than 1 % of total land consumption. Land take predominates over grey recycling in total land management in all countries. Green recycling, i.e. the development of green urban areas using previously built-up areas, is an important trend that reverses soil sealing, but it is a marginal process in all countries and, on average, it accounts for only 0.2 % of total land consumption. Land recycling is still low in all European countries: on average, land recycling accounted for only 13.5 % of total land consumption in European cities in the 2006-2012 period. The land use densification process, i.e. when land development makes maximum use of existing infrastructure, accounts for the largest proportion of land recycling (10 % of total land consumption). However, in most countries, land take dominates over densification in total land management with the exception of Finland and France. Grey recycling, i.e. internal conversions between residential and/or non-residential land cover types, is secondary to densification, ranging from 14 % to less than 1 % of total land consumption. Land take predominates over grey recycling in total land management in all countries. Green recycling, i.e. the development of green urban areas using previously built-up areas, is an important trend that reverses soil sealing, but it is a marginal process in all countries and, on average, it accounts for only 0.2 % of total land consumption. What is the extent of land recycling in Europe? This web map application enables the user to visualise the land recycling indicator for each of the Functional Urban Areas (FUAs) by entering the name of a city in the search window. When clicking the city of interest on the map, the following statistics are displayed in a window: land recycling as a percentage of total land consumption and the three components of land recycling (densification, grey recycling and green recycling) as a proportion of land take. For the three land recycling components, values above 1 indicate that the particular land recycling component predominates over land take. Values below 1 indicate that land take predominates over the particular land recycling component. For a complete overview, consult our interactive data viewer (see assessment text). Note: The boxplot shows land recycling as percentage of total land consumption for the period 2006-2012. The indicator addresses the reuse of abandoned, vacant or underused urban land for new developments. Land recycling is considered a response to land take, i.e. urban development on arable land, permanent crop land or semi/natural areas. It is a key planning instrument for achieving the goal of no net land take by 2050 (EC, 2016). For a complete overview, consult the interactive data viewer. On average, land recycling accounted for 13 % of total land consumption in European cities in the 2006-2012 period (Fig. 1 and Fig. 2). In other words, during that period only 13 % of all changes related to urban land development corresponded to land recycling. Finland (47 %), Malta (37 %) and France (22 %) stand out as countries with the highest percentages of land recycling. In a second group of countries, the percentage of land recycling is close to the European average: Latvia, Bulgaria, the United Kingdom, the Netherlands, Portugal, Germany, Sweden and Ireland (Fig. 2). In the other European countries, land recycling accounts for, on average, below 10 % of total land consumption. In these countries, all cities have the same low rates of land recycling, as indicated by the low variability in recycling rates (see Fig. 3 and the interactive boxplot of all functional urban areas (FUAs)) compared with the previous groups of countries. The lowest land recycling rates have been observed in Slovakia, Luxembourg and Cyprus, with around or less than 5 % of total land development in cities focused on land recycling. The so-called densification process, i.e. when land development makes maximum use of the existing infrastructure, accounts for the largest proportion of land recycling in Europe (9 % of total land consumption). Grey recycling, i.e. internal conversions between residential and/or non-residential land cover types, is secondary to densification (3.2 % of total land consumption), ranging from 14 % of total land consumption in Latvia to less than 1 % in Slovakia, Slovenia, Luxembourg and Lithuania. Green recycling, i.e. the development of green urban areas using previously built-up areas, is a marginal process in all countries and, on average, accounts for only 0.2 % of total land consumption. With regard to individual cities, Belfast has the highest rate of land recycling (90 %; see Fig. 3 and the boxplot of all FUAs), followed by Nice (80 %), Wiesbaden (77 %), Ruse (75 %) and Ouliu/Uleaborg (74 %). Most other European capitals have low rates of land recycling (below 10 %), except Riga, Paris, Sofia, Stockholm and Valletta. Finland is the country with the highest proportion of cities with FUAs within the top 30 FUAs where land recycling is observed (50 % of its cities; Fig. 4), followed by France (44 % of its cities; Fig. 4). These values should be interpreted in relation to the number of FUAs analysed: Finland has four FUAs, out of which two qualify in Europe’s top 30 FUAs in terms of their amount of recycled land; France has 31 FUAs, out of which 15 qualify in the top 30 urban areas in terms of the recycled land area. It should also be noted that there is large variability within these countries (e.g. in France, land recycling ranges from 5 % in Montpellier, to 80 % in Nice; see Fig. 3 and the boxplot of all FUAs). All these countries had implemented measures to restrict urban expansion to different degrees at the end of the period analysed (Prokop et al., 2011). However, the existence of measures and legislation to promote land recycling (and restrict urban sprawl) alone does not explain the differences. For example, Austria and Belgium had already implemented several measures and targets had been set, but the cities analysed had relatively low rates of land recycling (Decoville and Schneider, 2015). On the other hand, Finland had started to implement measures, but targets had not been defined (Prokop et al., 2011). However, Finland's cities have the highest rates of land recycling. This apparent mismatch between policy implementation and the extent of land recycling measured reflects the need for more detailed analyses to understand the impact of policies; such analyses should take into account the year of approval, the degree of implementation and the time needed to measure changes, which goes beyond the objective of this assessment. There are several factors, such as the specific geographical setting, that determine the amount of land available for urban expansion. This is the case for some coastal cities (e.g. Genova, with 60 % land recycling, and Barcelona, with 30 %, both well above the Spanish average) where the sea, on one side, and a coastal mountain range, on the other, restrict the space to expand the city and facilitate land recycling. In that sense, the size of FUAs has no influence on the level of recycling. How significant is land densification in Europe in relation to land take? Densification is one component of land recycling. It addresses land development that takes place within urban areas, making maximum use of the existing infrastructure instead of building on previously undeveloped land. Densification involves two main processes: (1) new developments in areas that are predominantly built up, and (2) the conversion of the so-called discontinuous urban fabric, green urban areas and sport and leisure facilities to dense urban fabric, economic areas and infrastructures. For a more detailed explanation, see the Methodology section . Fig. 5 shows the differences between countries by relating densification to land take, i.e. densification is shown as a proportion of residential urban sprawl and the sprawl of economic sites and infrastructures. This ratio is intended to show the relative importance of densification compared with new developments on previously undeveloped land. A value of 1 ha indicates that 1 ha of land has been developed following the principles of densification per 1 ha of land taken. Values above 1 ha indicate that densification predominates over land take. Values below 1 ha indicate that land take predominates over densification. As Fig. 5 shows, the rate of densification is well below 1 ha in almost every country in Europe, indicating that land take dominates urban development in Europe. Exceptions are Finland and France, where, on average, densification rates reach 1.5 ha and 1.2 ha, respectively (see also the boxplot of densification). It should be noted that Finland has only four FUAs (cities with more than 100 000 inhabitants) in the assessment, whereas France has over 30. Hence, Finnish cities perform similarly in terms of how much use they make of previously developed land, with values varying from 0.24 ha (Tampere) to 3.33 ha (Oulu) (see boxplot of densification). In France, however, the use made by cities of previously developed land varies to a larger degree, with densification varying from 0.05 ha (Melun) to 5.65 ha (Nice). The lowest rates of densification were observed in Slovakia, Luxembourg and Cyprus, whereas the lowest absolute densification was seen in the Italian town of Foggia. However, if densification is an instrument that reduces land take, these figures suggest that, in most cases, there is still a long way to go in achieving reduced land take. Considering the three components of land recycling (see the Methodology section), land densification makes the highest relative contribution to land recycling in 69 % of the cities for which data were available from Urban Atlas (220 out of 319 FUAs). In other words, land management that focuses on making use of existing infrastructure is higher than grey and green recycling combined, i.e. when buildings or transport infrastructures are built under redevelopment or when ‘green’ urban objects, such as green urban areas or sport facilities, are built. How significant is grey land recycling in Europe in relation to land take? Grey recycling involves the development of buildings and infrastructures on previously developed land. In other words, grey recycling is when ‘grey’ urban objects, such as buildings or transport infrastructures, are built under redevelopment. For a more detailed explanation, see the Methodology section. Fig. 6 shows the differences between countries by relating grey recycling to land take, i.e. grey recycling as a proportion of urban residential sprawl and the sprawl of economic sites and infrastructures. This ratio is intended to show the relative importance of grey recycling compared with new developments on previously undeveloped land. A value of 1 ha indicates that 1 ha of land has been recycled per 1 ha of land taken. Values above 1 ha indicate that grey recycling predominates over land take. Values below 1 ha indicate that land take predominates over grey recycling. In Europe, on average, only 0.1 ha of previously developed land is recycled in FUAs for each hectare of land taken. Latvia (0.33 ha), the United Kingdom (0.24 ha) and Malta (0.12 ha) are the countries with the highest rates of grey recycling in Europe. However, the grey land recycling rates, i.e. the rates of reusing previously developed land, are still well below 1 ha in these countries. However, some cities show positive examples: Stevenage (1.7 ha), Liverpool (1.28 ha) and Cardiff (1.02 ha) in the United Kingdom reuse their already developed land at a rate that is higher than the rate of land take (see boxplot on grey land recycling). The lowest rates of grey land recycling, i.e. reusing previously developed land, were observed in Cyprus, Slovakia and Luxembourg, where 0.01 ha of land is recycled for each 1 ha of land taken; therefore, the rate of reuse of already developed land is very low in these countries. The Italian city of Foggia has the lowest absolute value for grey land recycling in Europe. Latvia, Romania and Belgium are the only countries where 'grey' recycling predominates over densification (compare Fig. 6 with Fig. 5). If land recycling is an instrument that reduces land take, these figures indicate that, in most cases, there is still a long way to go in achieving reduced land take. How significant is green land recycling in Europe in relation to land take? Green recycling involves the development of green areas for, for instance, sport and leisure facilities on previously developed land. For a more detailed explanation, see the Methodology section. Fig. 7 shows the differences between countries by relating green recycling to land take, i.e. green recycling as a proportion of urban residential sprawl and the sprawl of economic sites and infrastructures. This ratio is intended to show the importance of green recycling relative to new developments on previously undeveloped land. A value of 1 ha indicates that 1 ha of land has been recycled per 1 ha of land taken. Values above 1 ha indicate that green recycling predominates over land take. Values below 1 ha indicate that land take predominates over green recycling. In Europe, on average, less than 0.01 ha green areas were created on previously developed land in the FUAs analysed. Latvia (0.013 ha), Germany (0.009 ha) and Bulgaria (0.009 ha) are the countries with the highest rates of green recycling. However, even in these countries the proportion of developed green areas remains well below the proportion of land taken for urban sprawl. The highest absolute green recycling value was observed in Mainz, Germany, but even here green recycling reached only 8 % of land take (see the boxplot on green recycling in all FUAs). In fact, in none of the cities analysed in Europe was green recycling dominant over land take in the 2006-2012 period. The lowest absolute green recycling value was observed in the French city of Rouen. In comparison with other land management processes, such as densification and grey recycling, green recycling is still far less common than any other urban development process. If land recycling is an instrument to reduce land take, these figures show that, in most cases, there is still a long way to go in achieving reduced land take. This indicator addresses the use of urban land for further urban development, whether that urban land is currently in use or not. The indicator comprises two concepts of urban development: land recycling and land densification. Land recycling is defined as the reuse of abandoned, vacant or underused land for redevelopment. It includes ‘grey recycling’ and ‘green recycling’. Grey recycling is when ‘grey’ urban objects, such as buildings or transport infrastructures, are built under redevelopment. Green recycling is when ‘green’ urban objects, such as green urban areas or sport facilities, are built. Land densification is defined as the land development that takes place within existing communities, making maximum use of the existing infrastructure instead of building on previously undeveloped land. The indicator examines land recycling relative to total land consumption. Total land consumption is understood as all the land use processes occurring on or ending up in developed land, i.e. urban redevelopment, urban and infrastructure sprawl, and any change in previously developed land. Land recycling includes both the densification and the recycling phenomena. Therefore, land recycling is understood broadly and includes three components: land densification, grey land recycling and green land recycling. The indicator is measured as the percentage (%) of land recycled (through all three components of land recycling) as a proportion of total land consumption. Land is a resource; it is the foundation of society, it is the platform for infrastructure and residential, commercial and industrial areas, and it is a source of economic growth. It delivers ecosystem services such as food provisioning and nutrient cycling, it hosts biodiversity and it contributes to climate regulation and the mitigation of climate change through carbon sequestration. Land contributes to climate change adaptation by helping to manage extreme events such as floods and droughts. However, land is also a limited and non-renewable resource and it is increasingly in demand for food, feed and fibre production, as well as for socio-cultural and industrial needs. Competition for land resources is a reality, and is increasing in the EU and in the EEA-39. Land take, the change from non-artificial to artificial land cover, reflects ongoing and often conflicting claims on land. Some of the land that is 'taken' for urban development is covered with an impervious surface, which severely hampers ecosystem functioning and the related delivery of ecosystem services. However, when land is 'recycled', land that was developed in the past and has become available for redevelopment again is reused. Urban densification, or infilling, can also prevent the consumption of land that may be very valuable for food production or recreation. Land recycling can be considered a response to the pressures that society puts on land resources, particularly in the urban fringe. Land recycling in its broadest sense, i.e. including densification, could be key to improving land management and maintaining and developing the green infrastructure that is so important for the provision of ecosystem services. It could also make an important contribution to fulfilling the EU's aim of achieving a circular economy, in which maximum value is derived from resources by the recycling and recovery of materials. Land recycling could also contribute to a green economy, which extends the concept of the circular economy to encourage economic development that is resource efficient and socially equitable and that respects the limits of the environment. Ongoing land take and soil sealing have long been a cause for concern at EU level. Resource efficiency has become a top environmental priority, identified as one of the seven Flagship Initiatives of the Europe 2020 Strategy, which supports a shift towards a resource-efficient, low-carbon economy for sustainable growth. Accordingly, one of the objectives of the EU's Roadmap to a Resource Efficient Europe is that 'by 2020, EU policies take into account their direct and indirect impact on land use, and the rate of land take is on track with the aim of achieving no net land take by 2050'. The recognition that our land resources must be conserved is also articulated in the EU's Seventh Environment Action Programme (7th EAP). The 7th EAP states that 'the degradation, fragmentation and unsustainable use of land in the Union is jeopardising the provision of several key ecosystem services, threatening biodiversity and increasing Europe’s vulnerability to climate change and natural disasters. (...) Every year more than 1 000 km2 of land are taken for housing, industry, transport or recreational purposes. Such long-term changes are difficult or costly to reverse, and nearly always involve trade-offs between various social, economic and environmental needs'. In this regard, the EU made a commitment in the 7th EAP to limit land take by setting the goal of 'no net land take, by 2050'. One of the key responses to the question of how land governance can reduce pressure on land resources by limiting land take and soil sealing is to increase land recycling. In this regard, Science for Environment Policy Future Brief 14 (EC, 2016) highlights the key role of the reuse and redevelopment of brownfield sites in achieving the ‘no net land take’ goal. The SOER 2015 thematic briefing on land systems (EEA, 2015) also states that, in order to prevent an increase in land take, incentives for 'land recycling' are worth pursuing. In the European Commission's 'Guidelines on best practice to limit, mitigate or compensate soil sealing’ (EC, 2012), one of the best practices mentioned is 'creating incentives for recycling land instead of developing new sites, for example requiring proof that no reasonable alternative to conversion of new land exists, and highlighting the potential of brownfield sites (many of which are well embedded in existing infrastructure and are not contaminated, thus avoiding overestimation of development costs)'. There are also specific examples at country level of approaches to land planning that include land recycling as a priority. For instance, in Germany, the council of the joint community Barnstorf decided, in 2009, to follow a sustainable land management approach: in principle, it was decided that, in the future, residential and commercial areas should be created through internal development, recycling and reuse, allowing for the conversion of greenfield sites in only exceptional cases depending on public costs and benefits (EC, 2012). There are no specific quantitative targets for land recycling in Europe. There are different policy documents that mention land recycling as an important response to reduce the negative impact of soil sealing, land take and/or urban sprawl when it comes to urban development. In this regard, the European Commission's Roadmap to a Resource Efficient Europe (COM(2011) 571) introduces for the first time a 'no net land take by 2050' initiative that implies either that all new urbanisation should occur on brownfield sites or that any new land take will need to be compensated for by the reclamation of artificial land. This should be interpreted to mean that land recycling and densification rates must show an increasing trend, which would result in a direct contribution to reducing net land take, thus facilitating the achievement of the policy objective. A resource-efficient Europe – Flagship initiative of the Europe 2020 Strategy The flagship initiative for a resource-efficient Europe under the Europe 2020 strategy supports the shift towards a resource-efficient, low-carbon economy to achieve sustainable growth. Natural resources underpin our economy and our quality of life. Continuing our current patterns of resource use is not an option. Increasing resource efficiency is key to securing growth and jobs for Europe. It will bring major economic opportunities, improve productivity, drive down costs and boost competitiveness. The flagship initiative for a resource-efficient Europe provides a long-term framework for actions in many policy areas, supporting policy agendas for climate change, energy, transport, industry, raw materials, agriculture, fisheries, biodiversity and regional development. This is to increase certainty for investment and innovation and to ensure that all relevant policies factor in resource efficiency in a balanced manner. The land recycling indicator is calculated from the Copernicus Urban Atlas dataset. The Urban Atlas dataset provides pan-European comparable land use and land cover data for FUAs. In order to assess land recycling, information on changes between two periods is needed. The Urban Atlas 2006 dataset includes 301 FUAs with more than 100 000 inhabitants (UA2006 FUAs) as defined by the Urban Audit. The Urban Atlas 2012 dataset contains 697 FUAs, including the 301 existing UA2006 FUAs plus 394 new FUAs (most EU-28 cities have over 50 000 inhabitants). Therefore, the land recycling indicator can be computed for only those 301 FUAs for which information is available from the Urban Atlas Change (2006-2012) dataset. 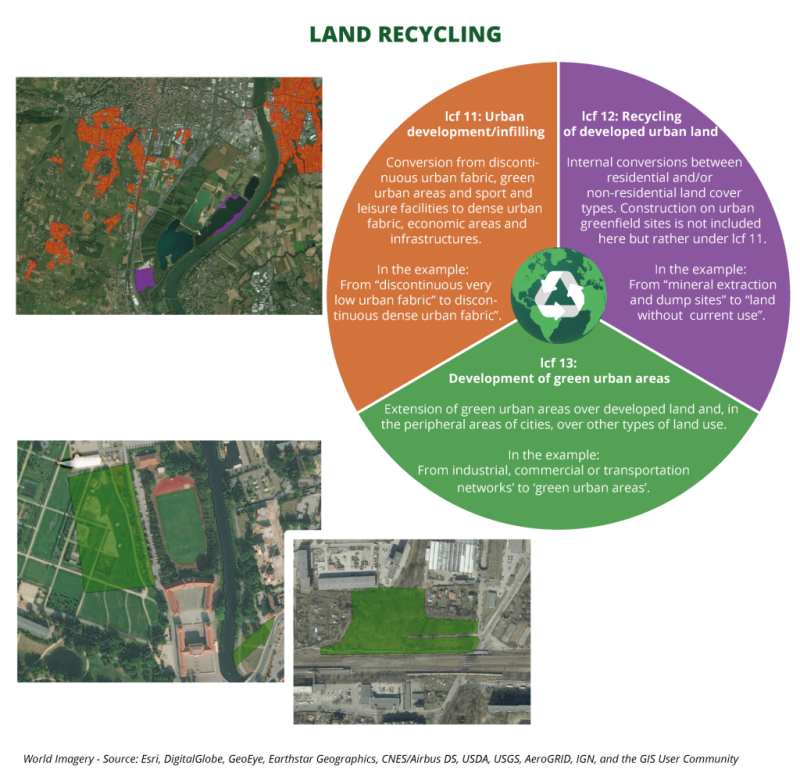 The concept of land recycling (in its broad sense) comprises both the densification of existing urban infrastructures and the recycling of abandoned land. In other words, it refers to the use of urban land for further urban development. Land recycling is calculated from land cover flows (lcfs), i.e. changing land cover categories, which correspond to the different recycling and densification phenomena. Each lcf corresponds to a set of land cover/land use changes, which are detailed in related methodology documents (Milego, 2015). They were adapted from the definitions of lcfs used for the Corine Land Cover inventory, considering the specificities of Urban Atlas classes. lcf38 — sprawl of sport and leisure facilities: conversion from developed and non-urban land to sport and leisure facilities. (a) excluding conversions from ‘Construction sites’ and from ‘Land without current use’, but including flows to these classes. (b) flows occurring only on artificial land cover (previously developed land). In order to better understand and assess the various land recycling processes, the three components of the indicator can be analysed separately relative to land take (i.e. urban, commercial and industrial sprawl). These components are land densification, grey land recycling and green land recycling. For these three components, the results do not reflect the extent of densification or recycling as a proportion of total land consumption, but compare the amount of land subject to densification or being recycled with the amount of land taken. For further details, please refer to the methodology references. There is no need for gap filling. The calculations are carried out based on all FUAs in Europe for which Urban Atlas Change (2006-2012) data are available. Land recycling in Europe: EEA Report No 31/2016 Land take, or the change from non-artificial to artificial land cover, reflects on-going and often conflicting claims on land. Some of the land that is 'taken' for urban development is covered with an impervious surface, which severely hampers ecosystem functioning and the related delivery of ecosystem services. However, when land is 'recycled', land that was developed in the past and has become available for redevelopment again is reused. Land recycling can be considered a response to the on-going pressures we as a society apply to our land resources, particularly in the urban fringe. The methodology behind this indicator has been carefully developed and tested, as described in the methodology reference document. The method was based on a former calculation of land recycling using Corine Land Cover data. This previous method was adapted to a new data source, Urban Atlas, which provides much more resolution and precision in terms of the urban environment. Taking into account the nature of the land recycling and densification phenomena, changing the minimum mapping unit from 5 ha (Corine Land Cover method) to 0.25 ha (Urban Atlas method) has allowed a huge improvement in terms of precision. In the calculations for the land recycling indicator, the relevant changes are grouped and classified into lcfs, following agreed definitions, and the ratios between lcfs are calculated. Despite careful methodological considerations, one potential issue relates to the extent to which land recycling is an intended/planned or unintended process. Land recycling may occur without any consideration of any beneficial environmental impacts or there may be geographical constrains that force the recycling of land. These issues will be explored in future work. This indicator uses the Copernicus Urban Atlas Change (2006-2012) dataset as a data source. With a spatial resolution of 10 m, Urban Atlas is mainly based on a combination of (statistical) image classification and the visual interpretation of very high resolution (VHR) satellite imagery. Multispectral SPOT 5 and 6 and Formosat-2 pan-sharpened imagery with a 2 to 2.5 m spatial resolution is used as input data. The built-up classes are combined with density information on the level of sealed soil derived from high resolution layer imperviousness to provide more detail on the density of the urban fabric. The Urban Atlas data are complemented and enriched with functional information (on road networks, services, utilities, etc.) from ancillary data sources such as local city maps and online map services. The minimum mapping unit of Urban Atlas is 0.25 ha for urban classes and 1 ha for rural classes. The definitions of lcfs representing land recycling and land densification have been established following the principles applied initially to the Corine Land Cover classes and adapted to the specifications of Urban Atlas. There are a couple of classes in the Urban Atlas dataset that correspond to intermediate states and might introduce some degree of uncertainty. Those classes are ‘Land without current use’ and ‘Construction sites’. The class ‘Construction sites’ is important for the calculation of the overall consumption of land cover. However, as this class represents only a transitional or intermediate land consumption class (as opposed to a final land consumption class), it has not been included in the calculation of land recycling if it is the original land class, i.e. before land change. The same approach has been used in the case of the class ‘Land without current use’, because, similar to ‘Construction sites’, areas of ‘Land without current use’ are in a transitional state. On the other hand, whenever either of these two classes are the result of the transition, those transitions are included in the calculation of land recycling. For further details, please refer to the methodology section and related documents. For references, please go to https://www.eea.europa.eu/data-and-maps/indicators/land-recycling-and-densification/assessment-1 or scan the QR code.